A super 8 film in a flea market in Mexico City holds the remembrance of news to come. It sums up the main events of the year, providing also a glance into the future. A historic testament: civil wars, storms and floods causing mayhem, labor strikes demanding better work conditions, progress in infrastructure and connectivity, countries invading other countries, powerful leaders meetings. It could easily be today’s news, but it was 1937. Knowing what followed the turmoils of the prewar time, the old news rendered a deep feeling of despair. They also had an ominous sense of deja vu. Future Past News situates visitors in an average living room circa 1937. The TV is on and the news is playing: governments in chaos, strikes, and impending wars. It could be today, but it was 1937. 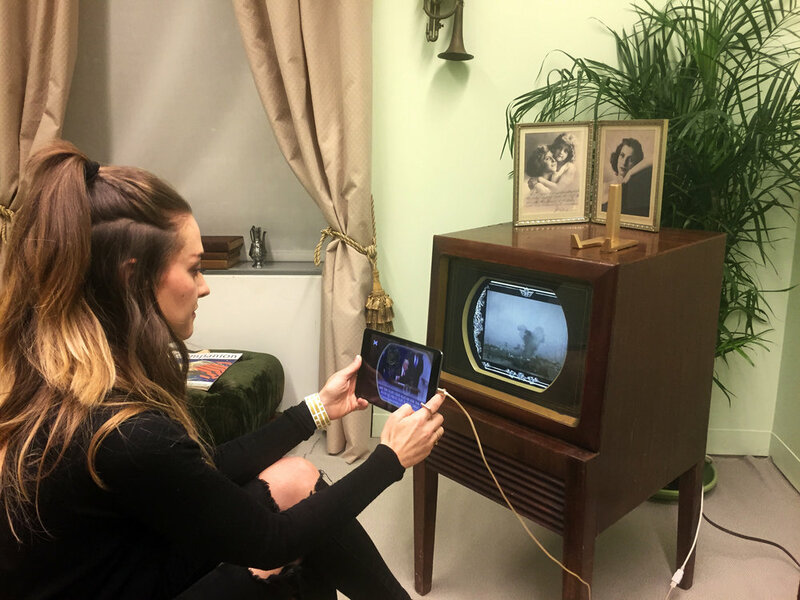 Visitors are invited to look at the images of the past through an Augmented Reality App that switches this content to present news. A new layer of information is added to the footage on the screen that juxtaposes the current state of affairs, showing how History repeats itself. The newsreel ends with a message of hope: ‘In the hands of these five men rests the destiny of the world: Mikado, Stalin, Hitler, Mussolini, and Franklin Delano Roosevelt. May they be wise, tolerant and sane – so that Peace on Earth and Good-Will toward men will reign for years to come’. We all know the ending of that story. But what if eighty years from now, someone found documentation of our news? Would they also feel a cold chill down their backbone? History is not linear, but circular. And events recur with other circumstances, names or scenarios, but remain basically similar. You think we would know better, but we tend to forget. Remembrance and memory must be distilled into a conceptual framework within which it can further exercise itself. We can and we must question History and unfold its methods of representation. Working with found footage allow us to look dialectically. We are not simply shown a vision of the world but rather the images of it. Augmented reality adds another layer of information, allowing us to question the meaning of that first image, that first layer. This enables a change of discourse and hopefully, change.